Last week I received a rather curious gold envelope through the post. So a bit like Charlie Bucket in Willy Wonka & The Chocolate Factory, searching for his golden ticket, I opened with anticipated breath. 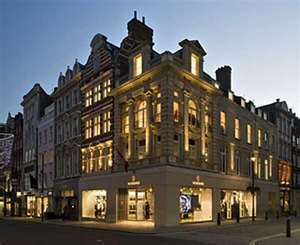 To my surprise it was an invitation to an event to be held down London’s fashion centre, Bond Street , home to Burberry, Polo Ralph Lauren, Tiffany & Co, Alexander McQueen to name but a few . The intro to the letter read ‘An evening of fine wine tasting and luxury shopping Thursday 17 November 2011, 6.30pm to 8.30pm‘. If that doesn’t tempt you, what would? 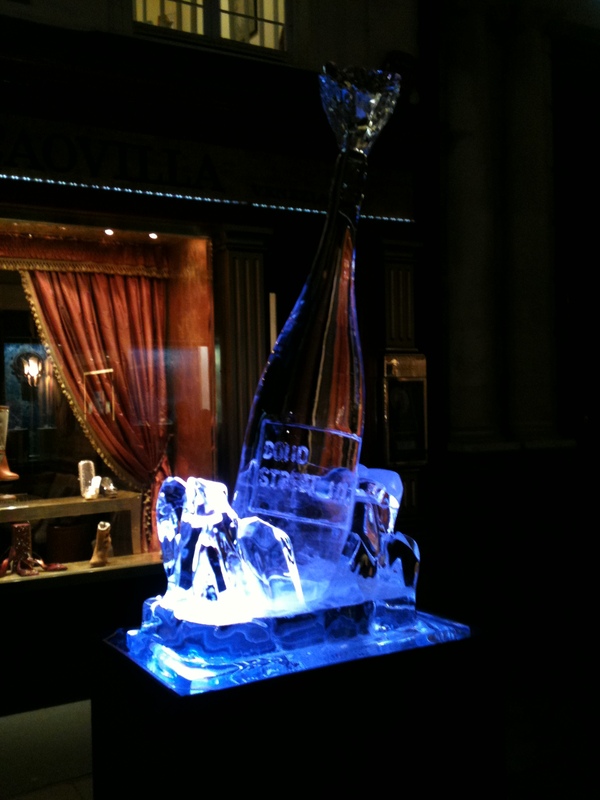 The event was put on for subscribers to Decanter. Unfortunately they couldn’t invite all subscription holders so I was part of a privileged group of readers. Two gold wrist bands were included with the invitation to allow access to the stores participating with a brief run down of stores and wine producers available. In conjunction with the Bond Street Association, hosts for the evening, producers were selected based on an affinity they share with these iconic brands. The evening began with a formal introduction by Lord Bruce Dundas, Chairman of The Bond Street Association, he was then followed by a brief welcome from Decanter Editor, Guy Woodward. Lastly the official opening of the evenings festivities, along with the turning on of the streets Xmas lights by Oz Clarke. After picking up my brochure and surveying the area, it was fair to say that these guys didn’t play around. Much to my surprise there were 32 stores participating with over 50 different wines, sparkling wine (French & English), Champagnes and spirits. All for my palatable pleasure. 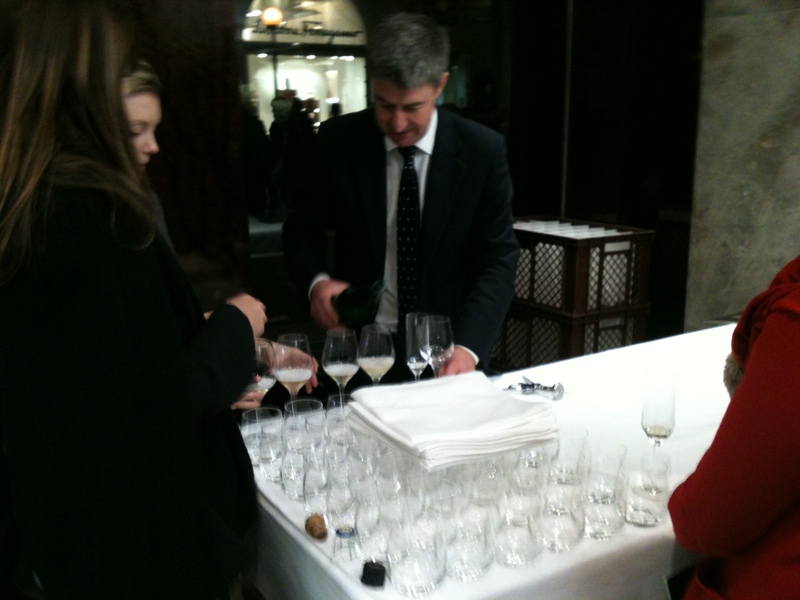 I first stopped in at Tiffany & Co where Champagne des Barons de Rothschild was being poured. I have to admit, I was unaware that the de Rothschild family dabbled in Champagne production. With three labels under the family crest, Brut, Rose and Blanc de Blanc, all wines are made in the traditional manner where Chardonnay is the contributing variety. The wines are then aged for 3 years in cellar before disgorging (removal of sediment) then a light, subtle dosage (replacing lost liquid with base wine and sucrose) is added followed by a long resting period. I enjoyed this wine, and what a way to start the evening. The Brut, a blend of 60% Chardonnay, 40% Pinot Noir. Full, ripe fruit with a dash of sugar, toasty, biscuit aromas. Soft bubbles on the palate. Clean, fresh fruit, good short length. 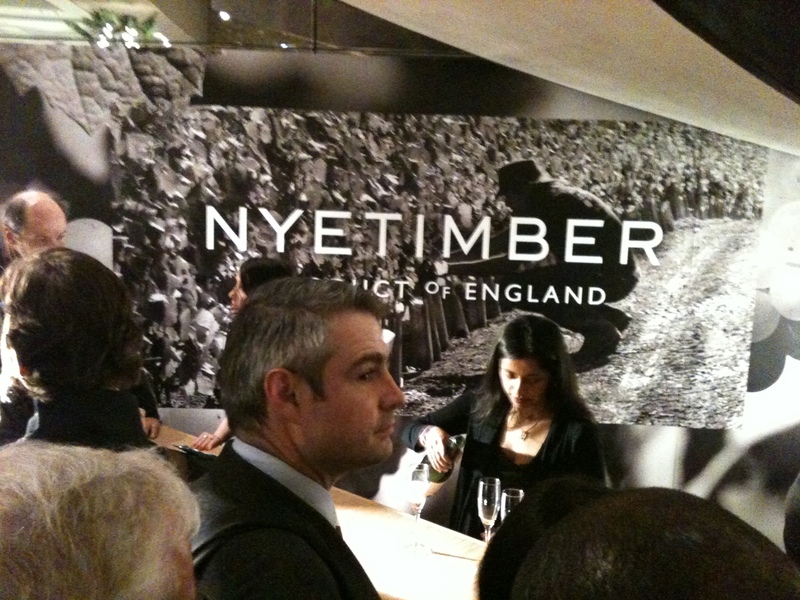 Next up I ventured over to Asprey where Nyetimber were showing their wines. What else can one do by following up a classic name in the world of wine with Rothschild than sample one of the leading lights in English sparkling wines. The 2006 Classic Cuvee. A blend of Chardonnay, Pinot Noir and Pinot Meunier. The 2007 Rose. A blend of Chardonnay and Pinot Noir. I treated myself to the Classic Cuvee earlier on in the year, personal birthday present. Clean, fresh, good fruit and acidity. Money worth spending. The 2007 Rose. Easy bubbles with light red fruit palate. Clean and fresh again. Your classic summer sparkler. During the ripening period the weather was warm and dry with lots of sunshine. The fruit was ripe for Rose by early October. The 2003 Blanc de Blanc. I’m a big fan of Blanc de Blanc wines. Good creamy texture with some citrus notes. Soft, elegant bubbles with same citrus notes on the palate. 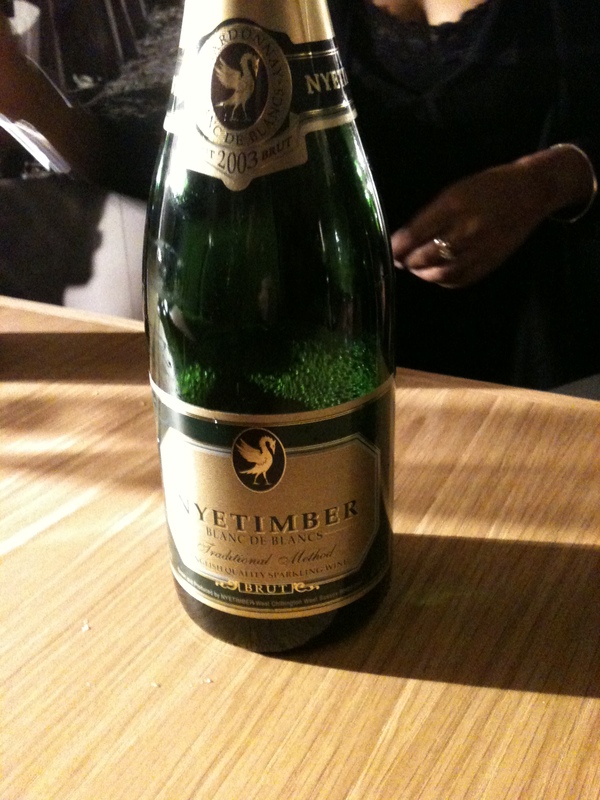 The 2003 vintage was memorable in producing one of the fruitiest wines from Nyetimber. If you haven’t tried Nyetimber wines, take it from me, they are well worth looking into. More bubbles beckoned on my next port of call where, stationed in the corner of a charming jewellers, Piaget, were the Champagne Goerg. Situated in the Cote des Blancs region of Champagne, home to the greatest Champagne Chardonnays. 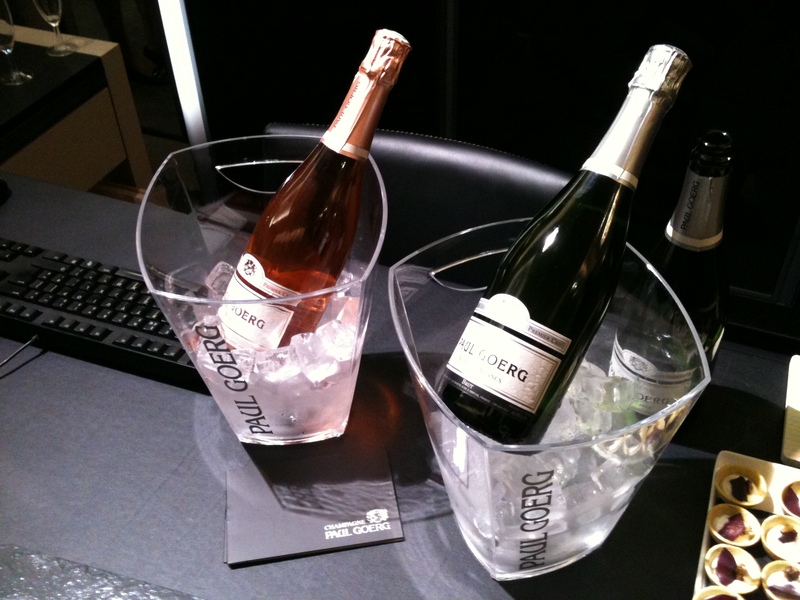 Two champagnes made the relatively short journey over the channel from their home The Brut Tradition and The Rose. First up the Brut Tradtition. 60% Chardonnay, 40% Pinot Noir. Light on fruit, fresh on bubbles, easy on the palate. Superb wine. Secondly the Brut Rose. 85% Chardonnay, 15% Pinot Noir. Soft strawberry aromas with, like the previous, light fruit and bubbles. If you like your Champagnes with the personality of a relaxed, laid back character, you’re not going to go to far wrong with these. Very easy, very elegant, very cool. Wines available from Laithwaites and Sunday Times Wine Club. Over the road from Piaget lies Polo Ralph Lauren. Hidden in this multi-storied clothes outlet were the wines from Laurent Perrier, Chateau Belle Brise Pomerol and La Fontaine de Coincy Bas Armagnac. Glasses were a bit short on the Laurent Perrier Brut stand but thankfully, upstairs, the Rose was available with sufficient crystal. My attention though was driven towards the Pomerol, wines dominated by Merlot and backed up with Cabernet Franc. The speaker was giving a mini masterclass on his particular area of Bordeaux. Pomerol is one of the smallest communes in Bordeaux. Situated on the right bank of the Dordogne river. It currently has less than 500 hectares under vine, compare that to neighbours, St Emillon, which has 5000 hectares under vine. The wines on display were from two different vintages, Chateau Belle Brise 2006 and 2009. The point of the exercise was to show the public how wines change from vintage to vintage. Both wines were excellent. Even the youthful 09 could, potentially, be drunk now, a bit of waste if did but nevertheless it showed enough to say you could. Soft red fruit on the nose. The palate was a wee bit tight and green, still with good acidity and tannins. Put in the 06 and you see the benefit of age. The aromas change drastically. A huge hit of cassis and tobacco on the nose. The fruit has developed too on the palate, still a bit green which suggests that this wine has only just begun but still a classy wine in the making. Finally I sauntered on over to Akris. 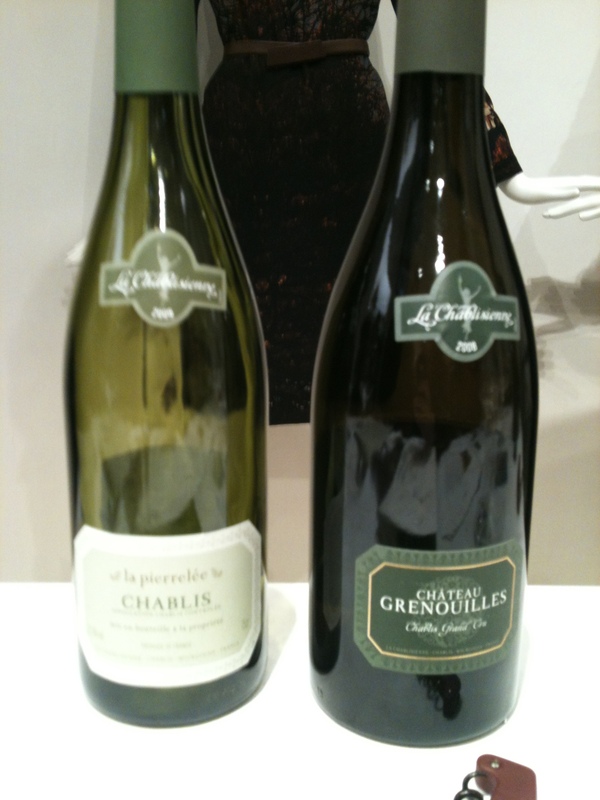 A boutique clothes store also base to La Chablisienne and Bailly-Lapierre Cremant. After having to wait 10minutes to gain entry, health and safety and all that, I was handed a glass of Cremant. Light and fresh, easy on the palate. Very enjoyable. Now for me to reminisce a tiny bit. I spent a few days in Chablis about 7 years ago with some colleagues of mine and had the fortune to go to the winery of La Chablisienne. We were given an exclusive tour around, not only the winery but the vineyards themselves. It absolutely tipped it down whilst we were amongst the vines, but who cares, we were there. In the winery we tasted about 15 of their wines. Not a bad one amongst them. Before leaving, each one of us was given a magnum of Chablis. Mine did make it back to the UK and…I managed to keep it for a few years before drinking it. It was good. Chablis la Pierrelee. Very green, herbaceous nose with prominent nettle aromas. Clean, crisp acidity and fruit. Chablis 1er Cru Cote de Lechet. Going up a notch here. The greenery of the 1st wine is replaced by more creamier, thicker, fruitier notes. A lot more depth on the palate. Chablis Grand Cru Château Grenouilles. Again, up another level. 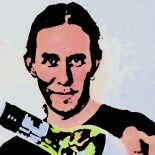 More rounded on the nose. The fruit is more elegant and more balanced with the acidity. The length lingers once the acidity dies away. Really, really enjoyed this one. This was a great night. More wines on show than I’d first thought there would be. There was a lot to see and do, and in only a 2-3 hour window time. Even I got to enlighten a couple of people. 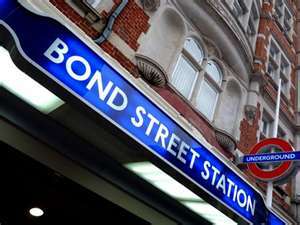 The organisation between Decanter and The Bond Street Association should be applauded. If you’d like a full list of wines on show then please do contact me. 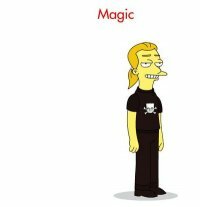 This entry was posted on November 18, 2011 by The Oenophiliac in Education, Events., Magics Scribblings., News..